Here are three strategies I use in my own climbing to reflect on the previous year and plan for better results in the coming year, with some examples of how to implement them. Near the end of this video, I discuss some supplementation I do while recovering from tendon/ligament injuries. The paper I reference is this one by Keith Baar and colleagues. Vlog #2 is published. We all think wooden hangboards are a no brainer. They are nice to use, they save your skin. They allow you to do more training. More folks are thinking the same about wood holds for the actual climbing. They are not a new invention of course! But this is the nature of history - old ideas get forgotten or go out of fashion and then get picked up again years later. In this episode I go through how I make my own wood holds, why I think they are a good idea and solve some specific problems I have with training on climbing walls, and how I set endurance circuits with them. Thanks for all the feedback so far on these vlogs. Glad to hear they are proving useful. For a long time I’ve considered making a vlog as an additional form of media to share ideas for improving at climbing. Now its happening and here is episode 1. I’ll post all of them up here on this blog of course, or you can subscribe to my youtube channel as well to make sure you catch the following episodes. In this one, I dive into how to make sure you are awake, alert and ready to train early if that is your window. And how to squeeze high quality training into a schedule so busy you can only spare ten minutes. Ten minutes. No excuses. I’ve just added the Edge hangboard to the shop. I’m excited to see this hangboard released which I’ve collaborated with Edgy Climbing Holds to design. I’ve used wooden fingerboards for 12 or 13 years and they propelled my standard in climbing beyond what I imagined they could (more on this below). So despite being on the face of it an extremely simple device, it is hard to overstate their importance in climbing training. 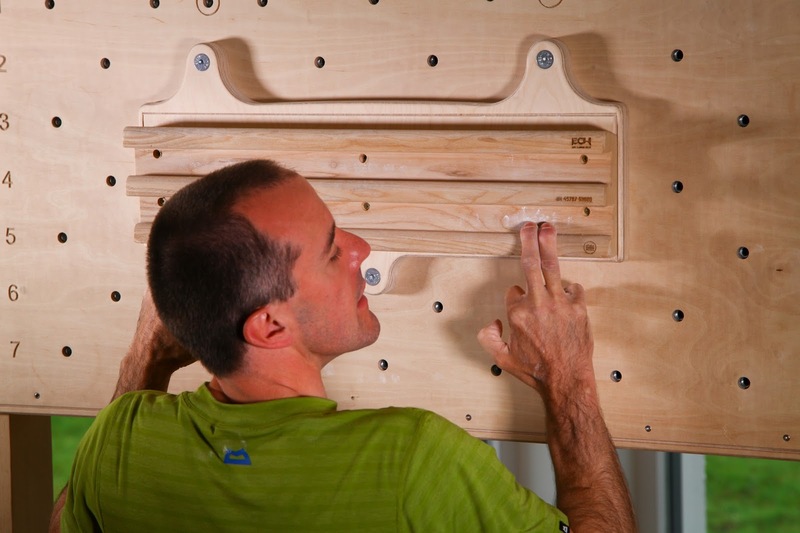 I’d call fingerboards and fingerboarding the core exercise and equipment for strength in climbing. Something every climber ought to have in their home and use year round. My first fingerboard was a single campus rung which cost me a few pounds. I used it to go from being stuck at around 8b/V10 for quite a few years to jumping forward to E11/9a/V14 in the space of about a year and a half. However, it wasn’t just any old piece of wood! The rounding and finish was just right for pain free comfortable training, and so I could do more on it and get stronger. Since then I’ve used some of the more popular models of wood fingerboard which are also pretty good. 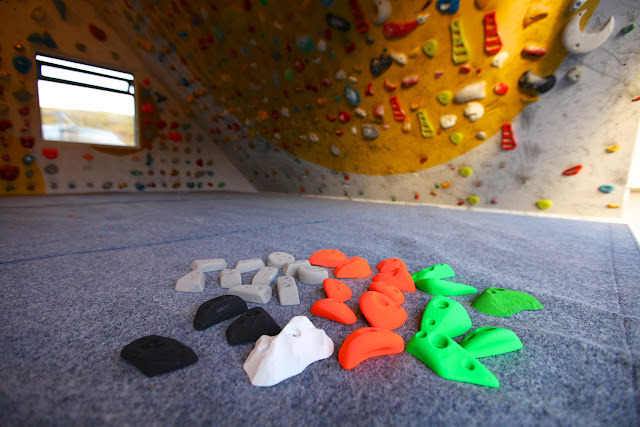 I’ve also visited some climbing walls with some fingerboard models which I feel are just nasty. Perhaps you can get away with lots of training on these for a while, but they just make my fingers hurt and as such end up being counterproductive in the long run. Obviously you can still make something great to train on by yourself if you have the skills. The problem is most people don’t do it and just want to buy one. So when asked to help design the Edge, I tried to think of the things I’d always wanted to make a fingerboard that is just right. First, I wanted to avoid plunged pockets. I’ve seen some climbers do exactly what I tend to do and use poor form by ‘nestling’ fingers against the sides of the pockets for extra advantage. After a quarter of a century of climbing, my index finger joints have become permanently twisted. It could be just normal climbing that does this, I cannot be sure. However, I wanted to ensure my core training tool could not contribute to this. So I wanted a fingerboard to have an open rung to force the user to use good form. Edge Hangboard from Dave MacLeod on Vimeo. Second, I wanted three rung sizes, all with a carefully designed profile. I experimented with lots of profiles and settled on shapes that for me hit the right balance of depth, roundedness and finish and would most likely suit most folks strength levels. Some climbers have asked me about the rung depths which are 45mm, 21mm and 15mm, so that they might compare between other hangboards, but this does not tell you anything useful as the difficulty of hanging the rung is a function of not just the depth but the roundedness and texture/finish of the wood. I’m all for looking at numbers in training where they can be genuinely informative. However, in my view this is not one of those cases. Which brings me to simplicity. My overriding goal with the Edge was to make the design simple. Removing unnecessary complexity to me is a highly desirable goal in all aspects of training, including the equipment. Simplicity re-focuses the athlete on the important things like level of effort, strict form, completion of the training and listening to the body. Additionally I’m acutely aware through coaching many climbers that the somewhat garish appearance of some fingerboards are an impediment to building fingerboarding into the regular routine of climbers with family/shared homes and busy schedules. A fingerboard that is conveniently situated is a lot more likely to get used, but some non-climbing relatives or friends legitimately object to a loud or ‘homemade’ looking training setup being installed in an otherwise nicely decorated kitchen or living room! So we wanted to make the appearance of the Edge as low-key and neutral as it could be without sacrificing any functionality. Climbers who live in a climbing household, or alone, might scoff at this idea, but I’m certain that a good number of climbers I’ve coached will welcome it and finally get their home fingerboard installed. 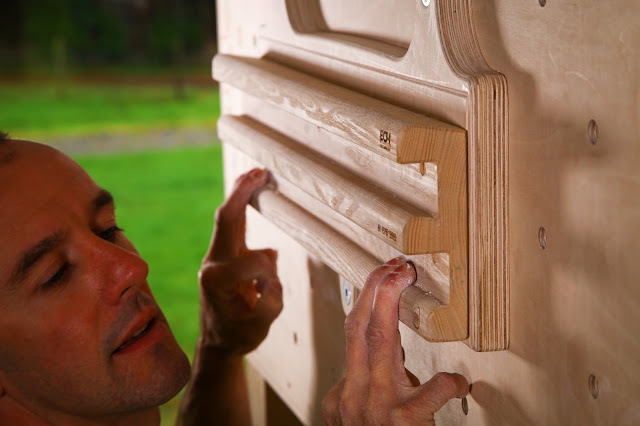 Finally, we wanted to make the hangboard from wood that is sustainably and locally sourced and manufactured. The hardwoods used to make fingerboards is a resource which can be a contributor to environmental damage along several lines (GHG emissions, transport, deforestation etc) and we didn’t want to be a contributor to this. We knew this would noticeably raise the cost compared to some other boards which sometimes use imported wood and/or manufacture in distant corners of the globe. Edge boards are made from Scottish Ash and each board carries the precise grid reference of the source tree. It also carries the Scottish Working Woods logo. As a licensee of this label scheme, it ensures that the wood and manufacturing is local, and the scheme is managed by a range of environmental organisations such as The Forestry Commission and Reforesting Scotland, which promote sustainable practice of both forest management in Scotland and production of wood products. Clearly, this is something that’s important to me, and my guess is that it will be important to lot of climbers, who as a group are more environmentally aware in general and supportive of efforts to minimise the impact of our activities on the environment. So, with all that said, if you are thinking “that all sounds good, I would like one, but how do I use it” I took some time to make the 25 minute video with a good deal of information about most aspects of how to fingerboard. My view would be that what’s not in this video is less important, but if it leaves you with further questions, please leave a comment below and I’ll try to answer it, and if need be update the video. The video is aimed at folk who don’t yet habitually fingerboard, or do a bit and want to get more out of it. In due course I’ll make another one with some even more geeky details for real board monsters. You can check it out and order here (shipping worldwide). How to Hangboard from Dave MacLeod on Vimeo. I don’t get much time to run climbing coaching sessions these days but I have just put up details of sessions I am running at my own wall in early December and over the Fort William Mountain Festival in February. These always sell out so if you are keen, do ring and book your place. In the past I’ve tended to run either full day coaching sessions for one individual or shorter group sessions. This time I’ve decided to try out a new format of full day group sessions/seminars. This way, there will be time for two climbing sessions in the day focused on particular elements of technique, training practice and additional exercises, as well as informal lecture/discussions over lunch and after the second climbing session to cover principles and practicalities of planning and customising your training as well as preventing and managing injuries. I’ll be running two separate one-day sessions on the weekend of December 3rd and 4th. 10am-5pm at my wall in Roy Bridge. Spaces will be limited to 6 climbers per day, £120 per person and climbers of all abilities are welcome. My wall is well suited to running sessions of this type folk operating at recreational grades right through to as strong as you like beasts! I’ll also be running another one day seminar on Feb 19th 2017, over the Fort William Mountain Festival, as well as more traditional three-hour technique masterclasses on Feb 18th (£60 per person for these). Full details and contacts to book a place are up on my events page here. See you there! I built a large climbing wall at my house a year and a half ago, not just for myself, but with the intention of running climbing coaching sessions there. I knew it would be great to have a dedicated climbing facility that I’d set up myself, without some of the limitations of big climbing centres. Last week, as part of the Fort William Mountain Festival, I ran my first few classes - three hour masterclass sessions with groups of climbers travelling from as far as Belgium to join us. I hadn't run clinics earlier as I spent some of last year recovering from surgery and then just wanted to go climbing! So it was really interesting to be assessing and observing climbers again after a break for a while and gave me a chance to reflect on what patterns these sessions reveal about climbers and what holds them back or propels them into improvement. Here are three themes that filled my mind after the sessions. As usual I met some climbers with good technique, some with strong fingers and some with good tactical awareness. But out of all the climbers on my sessions, I met very few who had trained themselves in how to try hard. And so they were not improving nearly as fast as they could be, even when they had already made other good training decisions. You can design a great training programme, show up and complete every session and immerse yourself in climbing tactics, but if you don’t know how to really try, where is the stimulus to yield improvements from that training? I think I was especially aware of this because we were in my own wall, where I normally train, uninhibited by anything. Some of the climbers I coached clearly had significantly stronger fingers than me, but I sensed that they did not habitually fight to the death on a routine basis. To gain strength, the body really needs to be pushed into it, especially if you are not that young any more. In my mind, a big overarching weakness of many, if not most climbers is simply the ability to get really determined to get to that next hold and hold onto it. Often when you put this point to climbers, they are confused, even a little unhappy about the suggestion they could be trying harder. But think of this applied to other core skills of climbing - Of course it ‘feels’ like you are trying as hard as you can, just as easy routes feel at your limit when you are unfit or sequences are at the technical limit of climbers who are not immersed in climbing day in day out. This does not mean this limit is fixed. The ability to focus physical and mental energy is trainable just as other skills are. The limit is not fixed. It is not just about delivering physical effort either. It is also the ability to make every single climbing session an immersion in deep concentration anticipating and then analysing each effort on each route, and comparing technical strategies for the moves with that of your climbing partners. Way too many climbers are resting their minds as well as their muscles in between efforts. If you start off by training your ability to focus and deliver a huge mental and physical effort during your climbing/training time, the rate of improvement rises. 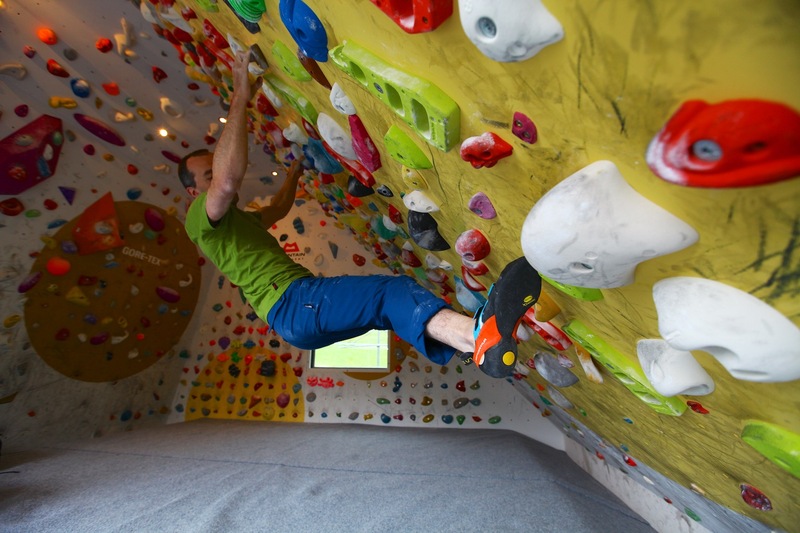 This helps to explain why two climbers who both climb the same number of routes per week at the same climbing wall improve at very different rates. A final point on this - often I find that it doesn’t always work for me to make this point about trying harder. Climbers sometimes consider me, as a professional climber and coach, to be somehow ‘a different animal’ and not subject to quite the same constraints. However, the great thing about group coaching sessions on a bouldering wall is that over the course of the session, as we work on problems, me offering technical pointers of the fine details of the movement that get you closer to succeeding on each move, climbers in the group start to rub off on each other and lose their inhibitions to try harder than they otherwise would. They see the others doing so as desire to solve the boulder problem overtakes physical and mental inhibitions. They concentrate deeper and pull harder and often pull off some moves that seemed far off, an hour previously. Even if they don’t, I always hope that climbers can see this happening among the group and understand that real concentration and real grit is the basis for training that works. Lesson? Boulder more, do it in groups of the keenest people you can find, and get into the habit of systematically offering each other feedback on moves and encouragement at every turn. Training is only training if you are really trying both physically and mentally. A big proportion of climbers are still seriously constrained by time to climb and train, and just as important, constrained time to rest and recover properly from the training they do get. Some only have time for one or two sessions per week. Others have time for four or five, but only get the results of two sessions, simply because they don’t have time to sleep, eat and rest well enough to get good results from their training. I hope that running coaching sessions at my own wall would spark people’s imaginations about what fantastic training facilities you can make in a small space. My wall is about as badass as they come for home walls and it took a fair few years of prudent financial decisions to get there. But I remind folk that my last wall was in a small room and was still amazing, and the one before that was a single campus rung. The single campus rung got me up the world’s first E11 and from 8b to 9a in 18 months. When time is constrained, convenience is the king of training variables. Many of the climbers told me familiar stories of living just minutes from a big climbing centre, but how it was difficult to get themselves to it in the 90 minutes or so they had to spare after a tiring days work that hits you after you put the kids to bed. I have two responses to this problem. First, a home facility, no matter how small, removes the ‘getting myself out of the door’ barrier to completing the training. Second, remember that when you feel tired later in the evening, it’s because your body’s metabolism is slowing down. You can usually reverse this feeling after a ten minute warm-up and feel just fine again. Moreover, creating a late evening ‘second wind’ like this doesn’t necessarily interfere with your sleep. In fact, the physical activity and mental wellbeing that goes along with it can often improve it. I noticed that the proportion of fingerboard-owing climbers seems to have risen since I started coaching ten years ago. However, the proportion of those actually using them has not risen nearly as much. This is a rather basic problem for which I offer some solutions in my book 9 out of 10 climbers. Underlying these is a principle that relying on using willpower to make yourself train if you don’t enjoy it tends to be unsuccessful for most. Instead, you change the environment or routine, to make it take willpower NOT to train instead. Putting your fingerboard in the highest use area of your house, so it’s where you always are, and highly visible is one way. Another is to use social pressure to your advantage. Ever noticed that your house is at it’s cleanest and tidiest when you have friends, or the landlord coming round to visit? You can capitalise on this social pressure in your training too. Invite your training partner round to share a fingerboard session two or three nights every week. You are less likely to skip it when you know they are coming. Got a TV programme or radio programme you never miss? Combine them with the fingerboard routine. It removes the boredom and makes it part of your week’s enjoyment. Digital tech these days makes this easier than ever. There are countless other ways to tilt the behavioural environment to make it easier to complete your training, and harder to miss it. Use your imagination for your own routine, or get a coach to tell you straight. It seems to me that the improvements in climbing walls could be widening the gap between the extremes of the bell curve of ability across climbers. Some of the climbers on my classes were in pretty poor physical shape, despite having a lot going for them in other aspects of the whole performance picture. Again, busy schedules are often the underlying theme responsible for this. But simply being aware of it can help you to mitigate it. A basic principle of training is reversibility. I discuss its implications in 9 out of 10 but I think it bears reinforcing as I still think climbers undervalue its effects. Many climbers have lost periods of weeks or months of little or no training for a few common reasons - work/accommodation/family transitions, injury or simply focusing on something that makes you weak such as trad or alpine climbing. Now, some loss of base level strength and fitness may be unavoidable due to these things. But that doesn’t mean you should completely abandon any attempt to mitigate them. Yet that is exactly what many, if not most climbers do. The result is that so much form is lost and it takes months to return to where you left off, if indeed you ever can. I have made this mistake myself several times. With hindsight I can see that 1 year without a board while I moved house and saved to construct my new board caused my level to drop to 8c. I was still out climbing just as much, but I just didn’t train. And so I lost strength, capacity to handle training and agility. Only now do I feel like I’m getting it back, 18 months later. Similarly, while recovering from surgery last year, although I trained harder than ever and emerged with stronger fingers after three months off my feet, I still lost some agility and base level of fitness. I could have mitigated much of this by incorporating more basic body strength and fitness exercises into my routine. You don’t need to make the same mistakes as me. Of course, this problem doesn’t always apply - keep in mind your individual weaknesses. Wall rats who can be found in the climbing wall training hard 5 nights a week are often pretty strong and fit, but their climbing ability on rock will never match this because they lack the hard-to-measure tactical skills of being a rock climber. So far weaker souls who get to the crag more often will still out climb them. Lesson? Life throws up things that interrupt your training. If you don’t plan for this, you’ll lose out. The time to really organise your training is not so much when you have lots of time, but when you have less. Don’t make the mistake of doing nothing, when you can only do a little. If you do, you’ll spend all the ‘good times’ just catching up to where you were, rather than breaking new ground. So there are some highlights of themes I noticed that applied to a good swathe of the climbers who visited my wall for coaching. Of course there were many more - frighteningly common footwork errors, training errors, poor diet choices, psychological approaches and many more. If you are reading this thinking you’d like to get some coaching yourself, stay tuned to this blog as I’ll post up some dates I’ll be running more classes during the year shortly. Some new shapes ready to go on my wall ahead of my first masterclasses at my place last week! I am seriously obsessive about holds, as any route-setter should be. Although you end up setting with a lot of holds you either don’t like that much or equivocal about, it’s always a pleasure both to set and to climb on holds you do. As I gradually gather holds for my own wall, it is slowly becoming a collection of rather fine holds I’ve seen in other walls or tried out. On the whole, climbing holds have improved massively and the industry is full of innovation. Despite this, I’m often still a fan of some old hold designs, especially when training for real rock - where an old school approach of fingery moves yields good results from training, at least for weaklings like myself. Which brings me to Stonesmith holds. I already have many of their holds on my wall at home and are some of my favourite shapes. As well as the nu-school innovative shapes, their training range also includes some very carefully designed shapes more designed for training which I love. It’s really an ideal mix - nice texture, a careful design that is nice to train on for long hours, but also nice and fingery. The differences between different manufacturers holds are obviously tricky to describe in words - they sit on a continuum of niceness to climb and set with and ideal texture. Stonesmith holds sit as far at one end (the good end!) as any I’ve tried. I’m glad to hear I’ll have the chance to set with more of them in the new Three Wise Monkeys climbing centre in Fort William next month. If you’ve got a wall, get some. I'm actually just off to order a set of their suspension training balls from their site just now. I've been meaning to get these for my poor weak thumbs for ages and wring this has galvanised me! Basic Ice Climbing Technique from Ellis Brigham on Vimeo. Here is a short video I made for Ellis Brigham and my sponsors Gore-Tex and Mountain Equipment with my thoughts on basic movement technique for ice climbing and also using an indoor ice wall for training for ice climbing. If you are like me, waiting for winter conditions to start shaping up in Scotland, you’ll no doubt be training like a demon and feeling fit. You need to be a little inventive to get the most out of indoor walls for training for ice and mixed. But it you go beyond just doing a few short top ropes and get a bit more systematic about using your time on the wall, you can do a lot to prepare yourself for the hard leads ahead when the forecast turns cold. If you’ve not been training - it’s never too late to start! Thanks to the staff at Ellis Brigham in Manchester for helping us have a good time shooting this video. Tendon Pain - Could your diet be a problem? Since publishing my climbing injuries book Make or Break earlier this year, this is the first important paper released into the scientific field during the year which has really caught my attention. Co-authored by professor Jill Cook (one of the tendon pain research big guns worldwide), it reinforces the idea I put across in Make or Break that looking at tendon injuries simply as ‘overuse’ injuries may at best blinker us to other important causes, and at worse be plain wrong. In this review, Cook explores the possibility that your cholesterol profile could possibly cause tendon pain. The evidence available shows association, not causation. Nevertheless, we shouldn’t ignore the data. Not only is it known that cholesterol accumulates in tendons, that people with the disease ‘familial hypercholesterolemia’ have much more tendon pain, but several studies show that various cholesterol parameters are associated with tendon pain. Influences such as this, if causation could be ultimately demonstrated, help to explain the apparently unpredictable individual variability in tendon injury, if you are looking at the problem solely as a result of training errors. So if we can’t ignore the data, we get to what we should do to improve our cholesterol profile. The paper points out that increased tendon pain is associated with the same cholesterol profile as cardiovascular disease, namely a lack of HDL cholesterol and an excess of LDL and blood triglycerides. Unfortunately, the world of medicine and public health is in a big fat mess when in comes to providing evidence based recommendations for how to improve our cholesterol profile. If you want to learn just how messed up the situation is, read Nina’s book. Apart from teaching you a few seriously important lessons about trusting both science and government, it might even save your life if it turns out to be right. No joke. Unfortunately the low fat, high carbohydrate diet (as well as the problem of the oils used in processed foods) that sportspeople are still widely recommended to eat may well cause just the bad cholesterol profile we are talking about (low HDL, high LDL, high triglycerides). Diet is not the only input of course. My personal hunch is that this line of enquiry will continue to yield evidence we should listen to. At a basic level, the idea that human tissue is unbelievably plastic, responding to training with precisely regulated growth and maintenance responses could go so frequently awry simply by doing some training does not add up. It seems likely to me that there are some things missing from the picture. This could be one of those things. I would urge anyone serious about their tendon health, their sport performance and their long term health to go right back to basics when it comes to diet and nutrition. It’s fair to say that the whole world of nutrition and health has been blown to bits in the past five years, and pieces are still falling back to earth. Meanwhile, some of the medical world and much of the public have yet to notice. And many vested interests are desperately trying to keep it that way. Personally, I have finally wriggled free from the paradigms I learned in University about sports nutrition and stand in a confused state of optimism mixed with distrust and scepticism. The problem is, we can't wait for better evidence - I have to eat something, in two hours time! So what to eat? I’m cautious about publishing my observations on my own diet and performance just yet. I will do when I feel a bit more comfortable and educated about what the hell is going on. But, I will tell you that I feel like I’m on an exciting journey!